When is a swimming pool so much more than a swimming pool? In short, when it is the inspiration for your personal backyard oasis. Whether you dream of lush green grasses and tropical plants or strategically placed boulders and stone features, Aqua Blue can take your ideas and turn them into reality. Landscaping, or poolscaping in this case, starts with an idea. That idea then turns into a plan. As the plan begins to take shape, you have the opportunity to make the changes to your property that you have envisioned. To get things moving in the right direction, you may want to sketch a rough outline, or even make a list of elements you would like to see in your space. Each region supports certain types of plant life. For your poolscape to thrive, you will need to choose plants and flowers that will tolerate the heat of Florida summers. Determining which shrubs and trees will be within a screened-in pool area or part of the surrounding landscape is important, so the screen is not damaged by fast or untamed growth. If you have a green thumb and love being surrounded by nature, an exotic poolscape teeming with tropical plants may be right for you. As a bonus, with proper planning, an abundance of vegetation offers added privacy. Trees, hedges, and shrubs are particularly good at blocking wandering eyes. Depending upon space, hanging baskets, large planters, or raised beds can add pops of color when filled with your favorite annuals and perennials. When seasons change, colorful annual container plants can be swapped out for varieties that like cooler temperatures. The simplicity of stone, brick, and decking makes it attractive for many people with busy lives who prefer not having extra plant life to maintain. This doesn’t mean your poolscape needs to be boring. Go for texture and contrast to appeal to the senses. Mix it up with rocks and stone slabs. Check out the different colors and shapes of available pavers. Waterfalls and fountains create a level of luxury in a poolscape that appeals to many people. Ornamental grasses bring in nature and require minimal maintenance. A screened in pool is common in Florida to provide protection from pests and a bit of shade from the sun. Consider the added privacy and safety a fence can deliver, especially if you have small children. 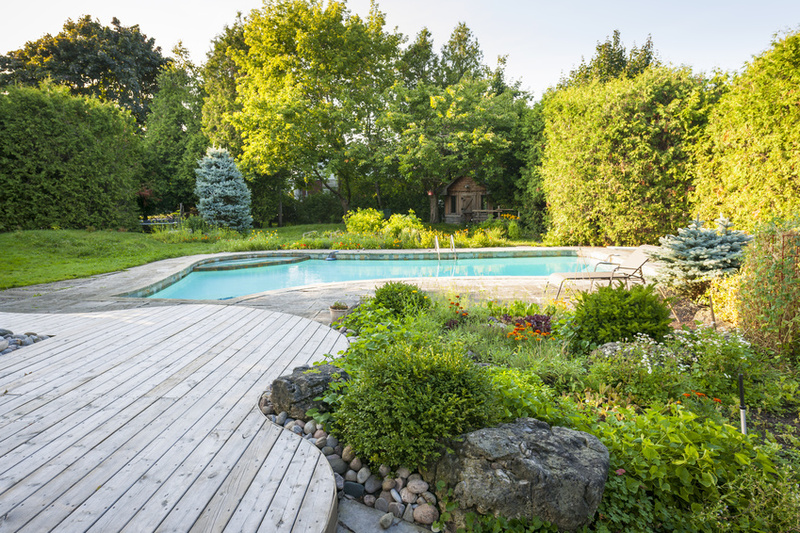 Unfortunately, the privacy afforded by hedges, shrubs, and trees does not keep people and animals out of your pool area. If you live in close proximity to others, or to natural waterways, the barrier provided by a fence is invaluable. Aqua Blue Pools has an all in-house crew to meet your needs. They are a full-service swimming pool company, so they have total control over the construction and final quality of your project. They can take your rough sketches and ideas and turn them into reality, from pool construction and remodeling to pool care and repair.